I finally bought a wok. This is pretty exciting and intimidating at the same time. I’ve never owned any fancy kind of cookware. Granted, I bought it at Marshall’s for $10, but I still bought a wok. I let it sit on the kitchen counter for a few days, price sticker still on it. I’d look at it and think, “Do I really this?” I mean, it was only $10 but … do I need ANOTHER cooking vessel? (Brad’s answer – No) But it’s a wok! Shouldn’t every kitchen have one? Sure! After a couple of days I finally took the sticker off and threw the receipt away. No turning back now! Yes. I seriously asked that. I’ve never made fried rice. I love ordering it. But I’ve NEVER made it. So fried rice is the first thing up in the wok. But not just any fried rice. I’ve had my eye on this recipe from Rosie the Londoner. 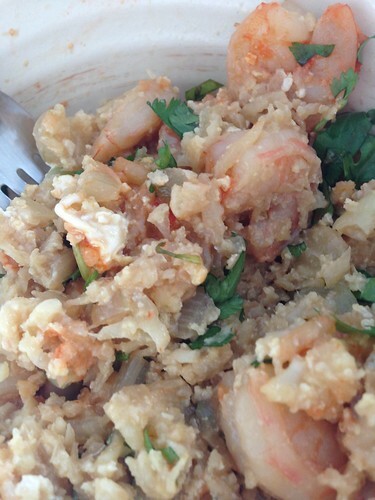 She has a guilt free egg fried “rice” recipe that sounds amazing. And since it’s a new year, might as well be healthy (just to start eating delicious trash later). Bust out that wok I know you all have tucked behind all of your pots and pans and preheat that sucker. No oil just yet. The “rice” is not just rice, though. Cauliflower, friends. Cauliflower. 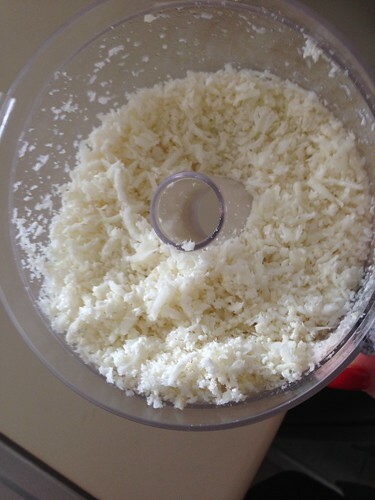 You take that cauliflower and zip it through your food processor with the grate attachment. Chop up some onions and garlic as well (but don’t mix them together). Once the wok is hot, drizzle some oil (not olive oil, something with a higher smoking point so you don’t fill your kitchen with burn) down the sides of the wok and toss in your onions and garlic. Cook for a few minutes or until they start smelling delish. Toss in your shrimp if they’re raw. If they’re cooked, skip this step and add them in last to warm them up. 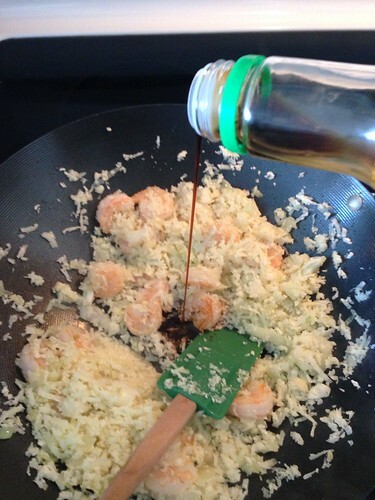 Cook your shrimpies until just cooked – they’ll stay in the pan so you don’t want to over cook them. Dump in your “rice” and stir, stir, stir! After a few minutes, drizzle in some soy sauce and continue to stir. I also added in a little bit of rice vinegar. 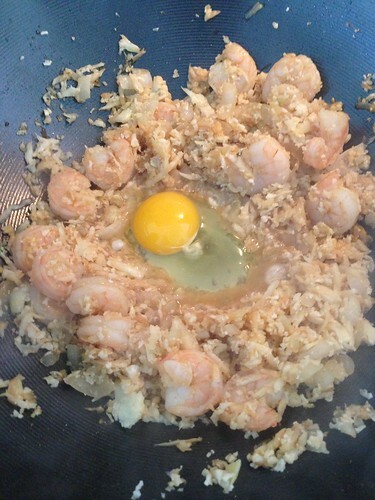 Once everything is incorporated, make a little well in the center of your wok and crack an egg. Let the egg cook a little bit until the white starts to set and then break the yolk. Stir that around a little bit and then stir the whole thing again. Once the egg is cooked, remove from heat and serve. That’s it! So simple! It doesn’t look glamorous but man is it tasty. And not bad for you at all. 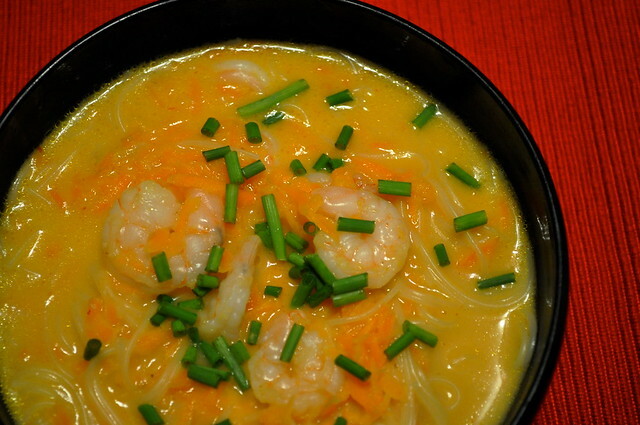 Serve it with some sweet chili sauce or sriracha, depending on how you like your heat. Don’t forget the cilantro! Because that makes anything delicious. Experiment with your proteins. Chicken, steak, tofu. Add more veggies – snow peas, shredded carrots, peppers. 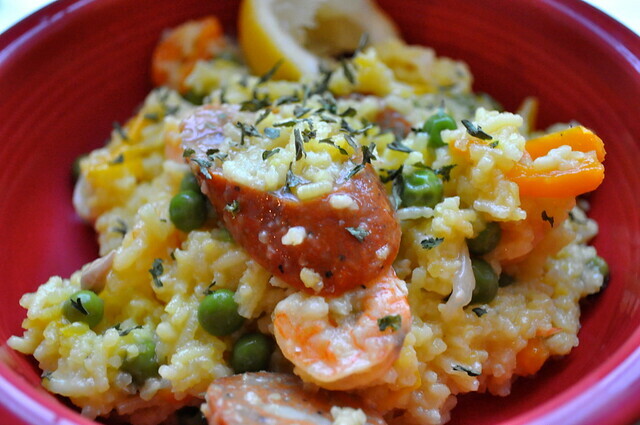 You really can’t go wrong with this basic fried “rice” recipe. Now I want to stir fry EVERYTHING. This wok is fun! i love pasta but sometimes i want something other than a red sauce. with the weather getting warmer i like to keep my dinners light tasting yet still delicious. and i also like to cook for the least amount of time possible. a hot kitchen on a hot day is not ideal. this quick meal is a one-pot stop that will get you from the stove to the table in no time. bring water to a boil and add the pasta. after 8 minutes toss in the shrimp and cook for 3 minutes or until the shrimp is done and pasta is al dente. drain. 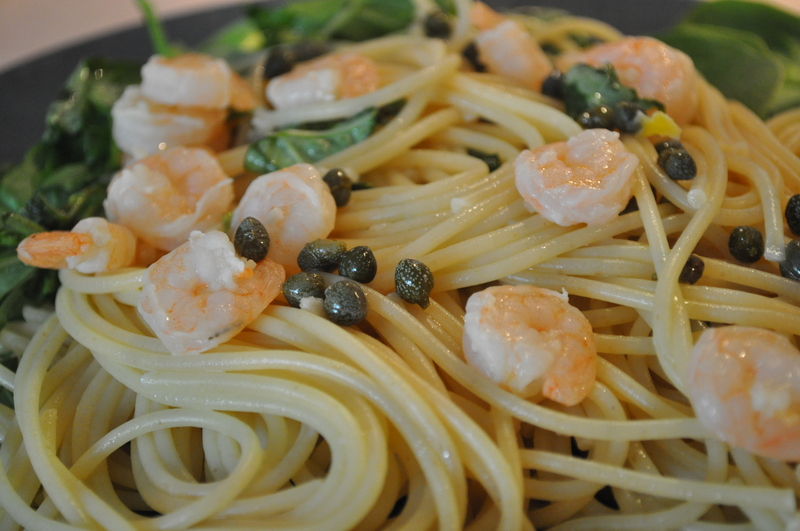 place pasta mixture in a big bowl and stir in basil, capers, olive oil, lemon juice and salt. serve pasta mixture over the spinach and enjoy. i really liked this dish. simple, fresh, nothing too complex but still enjoyable. i think next time i will try chicken or salmon. they would mesh well with the other ingredients in my opinion. while i’m on the subject of the ingredients of this dish, i’ve always been weary about capers. i don’t know why because i’ve never tried them. i decided to go ahead and try them at least once and i was pleasantly surprised at how yummy they were. they definitely added the extra zing to this dish that makes it great to enjoy in the spring time. consider me now on the caper bandwagon.